Welcome to the Cat Training & Repellent superstore! Training a cat do obey your rules may seem like a lost cause, but it's actually far from impossible. Cats may not respond to direct instruction or reprimand, but they do learn from experience. If they have an unpleasant experience when doing something they shouldn't, they will quickly learn not to do it again, if for no other reason than their own comfort. Our selection of cat training mats and repellent sprays are safe, effective ways to create boundaries and teach your feline friend to behave herself naturally! Pet Mountain's Cat Training & Repellent store features top quality products from the most trusted names in cat care and training, including PetSafe, Boundary, Pet Organics, and Four Paws. Our Cat Behavioral Aids selection includes safe, effective ScatMats, rough, spiky pads that create an uncomfortable surface for your cat to walk or sit on. Simply place one on your sofa, mantlepiece, table, counters, or other forbidden surface to quickly teach your cat to stay off. And if you have a cat that loves to wander far afield, an in-ground cat fence is a great way to make sure she doesn't get too far. The indoor fence is useful in protecting your pet from getting lost, hurt, or worse. Our Cat Training Repellents use your cat's natural instincts to your advantage, creating scents that cats find unpleasant to keep them away from wherever they shouldn't be. Boundary Dog and Cat Repellent Granules help keep your pets away from patio furniture, flower beds, trees, shrubs, garbage cans/bags, and other forbidden areas. 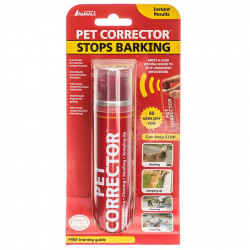 Boundary Granules will repel dogs and cats for up to 24 hours when applied daily. Boundary Indoor / Outdoor Cat Repellent Spray is a training aid specifically formulated to help keep cats and strays away from selected areas in and around your home for up to 24 hours when applied daily. 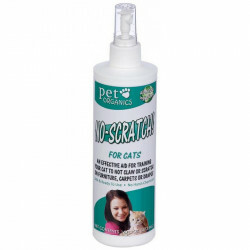 Pet Organics No Mark Spray for Cats is an all-natural blend of fragrances that work to break the cycle of urine marking. Although it will be odorless to you, your cat will smell it and become calmed and satisfied with the aroma.